They are beaten. They are battered. And if they’re smart, they escape the shackles of free labor before the length of their potential career has been shortened too much. There was a time when Dorsett sprinted away from defenders, when Herschel manhandled would-be tacklers, and when Marcus Allen looked like he was playing against junior high kids where the running back was a god. But gone are the days of the collegiate running back as football royalty. As more is now known about the wear and tear players are susceptible to, coupled with the modernization of the passing game, backs taken a backseat to the signal-callers as the pinnacle of college football excellence. Running backs are now looked at as a fungible asset, only as good as their health, ball security, versatility and the options lurking in the shadows. The Heisman Trophy was a running back award at one point. From 1973 to 1983, 11 consecutive running backs (including Archie Griffin twice) were recipients of the highest individual honor in the land. This was the longest period of time dominated by one position in the award’s history. Over the next 16 years, six running backs received the award along with seven quarterbacks, two wide receivers/return men, and one cornerback, perhaps an indication that the tide was changing. It’s safe to say, based on the last 18 seasons, it’s a quarterback award now. Only three running backs – Reggie Bush, Mark Ingram and Derrick Henry – have stepped to the podium to strike a pose and it’s a honest to god question as to whether there will be many more. The quarterbacks have the ball in their hands more than ever and that doesn’t seem to be changing anytime soon. So what will it take for a running back to win the trophy again? It certainly doesn’t come down to the best numbers. 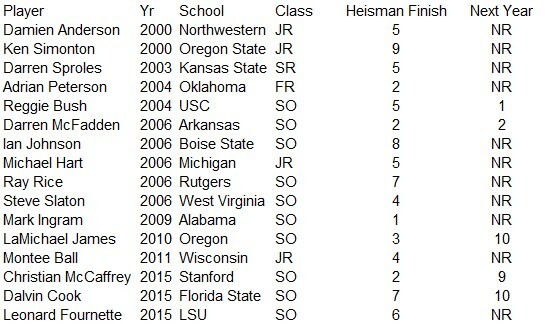 There have been 53 running backs to finish in the Heisman Top 10 since 2000 and the difference between the winners and the others is miniscule. These of course are stats PRE-BOWL, when the voting is done. In fact, of those 53 running backs, 10 rushed for over 2,000 yards. Zero won the Heisman. The top ten in touchdowns, the top 13 in yards from scrimmage and the top four in all-purpose yards – zero won the Heisman. Stanford running back Christian McCaffrey, who, even before his record-setting Rose Bowl performance against Iowa, had put up maybe the most ridiculous statistical line of all-time for a running back – 1,847 rushing yards, 1,109 return yards, and 540 receiving yards – lost to Henry in 2015. Based on the three recent winners mentioned, it will take a lead back on a National Title contender. In Bush’s case, he wasn’t a “traditional” tailback given his importance in the pass game and on special teams, but he was still the number one playmaker on a spectacular team. Ingram’s numbers by Heisman standards were less than spectacular, with all five players behind him in the 2009 voting – Toby Gerhart, Colt McCoy, Ndamukong Suh, Tim Tebow and CJ Spiller – having a legitimate claim to the trophy. It also takes opportunity. Pete Carroll made a conscious effort to give Bush the ball more as a traditional tailback in 2005, while Ingram stepped up to replace Glen Coffee, and Derrick Henry benefited from the departure of his time share partner in TJ Yeldon. 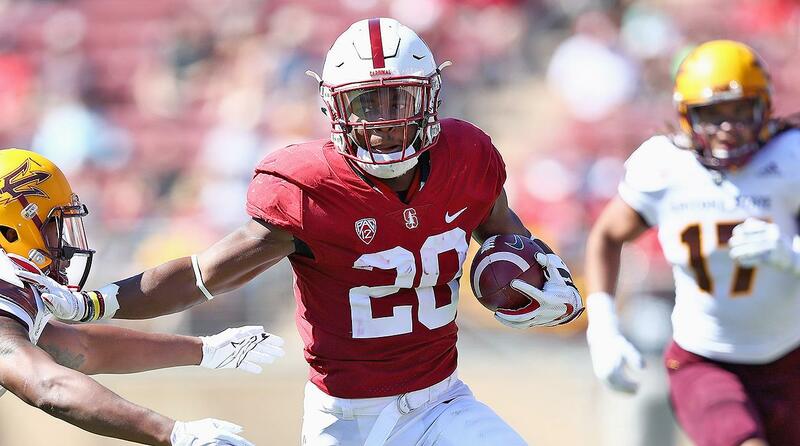 Heading into 2018, Stanford’s Bryce Love and Wisconsin’s Jonathan Taylor find themselves in the Top 3 of most people’s projections, but recent history insists that those running backs that finish in the top 10 one year, don’t fare so well in the next. Of the 16 running backs to return for another college season after finishing in the top 10, only five have finished in the top 10 of voting the next year with only two finding themselves above eighth. Bush and McFadden remained active in the return game at their schools in their second season, raising their stature in voters eyes. But their teams were perhaps able to take those risks because they had capable backs behind them in Lendale White and Felix Jones, respectively. Also, McFadden threw four touchdown passes out of the wildcat in that second season, showing that voters practically needed to see a gimmick in order to keep them interested in the running back. The real reason running backs seem to falter in the year after, as far as Heisman voting goes, is most likely due to a mixture of reasons, rather than just one. Wear and tear is a factor. Peterson, Ingram and Fournette all fell victim to injuries. Numbers are a factor. Running backs have to put up such spectacular numbers just to get into the conversation now that any slight step back renders them irrelevant. It’s so incredibly hard for these players to string together outstanding seasons for both of these reasons. And then of course there’s the dependence on team success. Players like Robert Griffin III, Johnny Manziel, Tim Tebow and Lamar Jackson didn’t need to be in national title contention to receive their accolades, but with so many running backs putting up huge numbers, that’s a higher standard they’re being held to. Looking at this season, we’re left to wonder, if Love and Taylor MAY NOT capture the Heisman, is there anyway to pinpoint who may? Factoring all of the aforementioned variables – lead back on a National Title contender with little wear and tear and an opportunity to step into the lead back role or more of a feature role – we can whittle the list down to a few names who fit the bill. Looking at the previous season for the three Heisman winning running backs provides some clarity. Each player was a major contributor, but didn’t put up true lead back numbers, mainly due to the fact they weren’t the main guy. Using the following thresholds – less than 1,000 rushing yards, less than 175 carries, and at least 10 touchdowns – along with the caveat that a player must be on a title contender leaves three candidates for 2018. Etienne (80-1) is one of the most explosive players in college football, bursting onto the scene during his freshman year in 2017. The Clemson tailback showed he was capable of breaking loose for a touchdown at anytime. With a quality offensive line in front of him and an improved Kelly Bryant in the passing game, the only thing holding Etienne back may be Tavien Feaster and the other talented players in the Clemson backfield. Michigan’s Karan Higdon (odds not posted), despite playing for a team with no passing game to throw defenders off the scent of their intentions to run the ball, put up close to 1,000 yards in 2017. Fellow tailback Chris Evans returns, but Higdon remains the top dog and with a quarterback in Shea Patterson that at least poses a threat to the opposition, there could be an opportunity for bigger numbers for him this year. And finally, it seems only appropriate to end with an Alabama running back considering the stockpile of quality ones they’ve had during Nick Saban’s tenure and because two of the three winners we’ve been discussing were members of the Crimson Tide. Najee Harris has been talked about as the next coming, but I don’t think Damien (55-1) returned for his senior season to take a back seat to anyone. Given the history of the award, I wouldn’t bet your mortgage that one of these running backs would win it. But if you can get good odds, as you probably can right now, it might be worth a shot. Follow Jeff on Twitter @jfey5 and find his other work here, including a comparison of modern Super Bowl teams, the best playoff QBs in recent memory, and his look at Allen Robinson and the Unknown in Chicago.